As they always say New Year, new blog, right? Right! In the spirit of ~newness~ I want to share with you all some updates that this blog is currently undergoing. First off, as some of you may have already noticed, there's a Press page of the blog! Now you can easily see all the places where Sara is spreading the Boka Dulse love! Yahoo! On this page you can read, listen, and watch all of the different media publications that have featured Sara, including her upcoming biweekly radio show (in Spanish) about Jewish food history for RadioSefarad. Additionally, you'll find some new images, restaurant recommendations, and sites on the Travel page. Looking for travel inspiration and great tips? The newly-updated Travel section is where to go! Now you'll be able to explore my images and tips from my travels during this past year. Cities covered include: Madrid, Ávila, Burgos, Castilla, Granada, Lisbon, Salamanca, Tenerife, Toledo, Valencia, and Zaragoza. And if you're planning a trip and have any questions for me, feel free to write me a message . This could happen at your synagogue! Sign up here to have me come teach. Finally, a big update for this blog can be found here. I've been doing a great deal of teaching over the past few months, and I'm offering my skills to any Jewish community that wants to come have me teach! Looking for an interesting way to engage synagogue members in Jewish learning? Want to find new ways to engage and interact with Jewish culture and community? Whether you're interested in Sephardic Jewish food history or want to know more about general Jewish food history and identity, I'd be delighted to come teach at your synagogue today. Customizable to your community's needs and schedule, I offer the options of one-off classes as well as class series. Classes include two parts: one on the theory of Jewish food and identity; the other dedicated to cooking the dishes we discuss in class. Contact me here today to set up a cooking lesson with me! Anyway, that's all for now folks! Keep your eyes peeled in the next couple of weeks for more new and exciting stories and history from your favorite Jewish food history blog, Boka Dulse. I started this blog - happy one year anniversary! - and updated it with recipes and adventures from across Spain, including stuffed peppers symbolic of Avila, the secret history of one of Spain's most famous cakes, and a babka inspired by Klimt. The Basilica of San Francisco el Grande at sunset. I moved into one of Madrid's coolest neighborhoods, La Latina and discovered the joys of this quirky, cool barrio. Highlights include the weekly market of the Rastro, the specialty Syrian and Moroccan spice shops around the corner, and vibrant sunsets. Sunset on Calle Maldonadas, of el barrio La Latina. At the beginning of my grant, I met a woman named Clara Maria Gonzalez de Amezúa - who I call the grand-dame of Spanish cuisine. She opened the famous cookery shop and cooking school Alambique, located right near the Teatro Real (Royal Theater) of the metro stop Opera. I had an amazing lunch at her incredible house outside of Madrid (profiled here in Elle Decor) and then was lucky enough to take a cooking class at her school, learning the delights and intricacies of Turkish cuisine. A delicious discovery from the Turkish cooking class: Turkish apricots sautéed in lots of butter and finished with chopped walnuts. I worked in some great archives, including the Biblioteca Nacional and the Biblioteca Tomas Navarro Tomas of the Centro de Ciencias Humanas y Sociales of the CSIC, finding fascinating sources on the history of Sephardic and Spanish Jewish food in medieval Spain - from Inquisitorial trials to 19th century cookbooks to the Edict of Expulsion itself. I visited Morocco twice - once for my cousin's wedding and the other to lead a trip of college students across the north of the country, sampling couscous and tagines along the way. 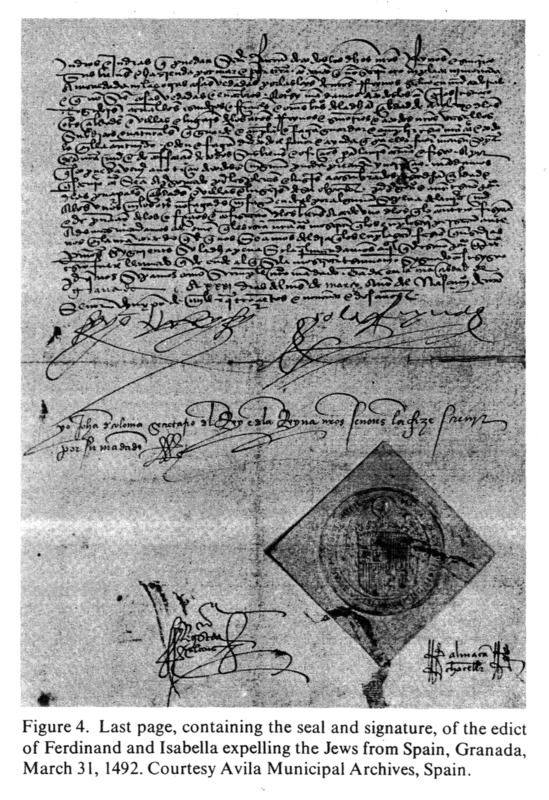 An image of the last page of the Alhambra Decree, or Edict of Expulsion of the Jews from Spain, courtesy of Google images. An Almoravide structure called a Qubiya, located in Marrakesh. At Yves St. Lauren's famous blue house in Marrakesh. 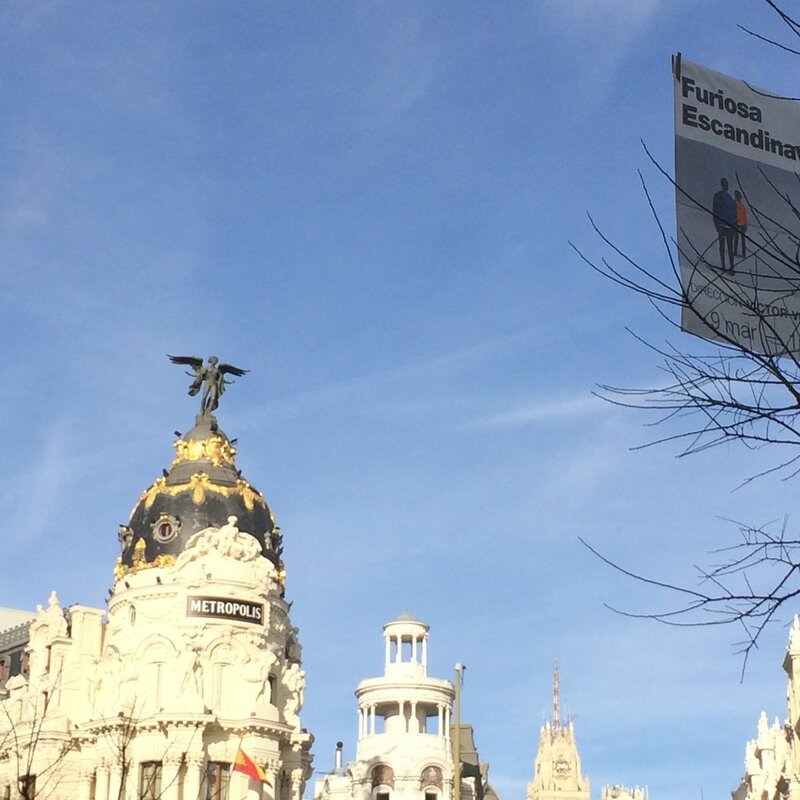 I became highly involved in the Madrid Reform Jewish Community (check them out in this JTA article written by one of our very own members...see if you can spot me in one of the photos! ), attending weekly Shabbats and events while also teaching a history-based cooking course for them. The class I taught explored Jewish identity through its diasporic kitchens. We made everything from Ashkenazi kugel to Sephardic keftes (leek fritters) to Yemeni doukeh (charoset). Get in touch with me on this page if you'd like me to come teach at your synagogue! 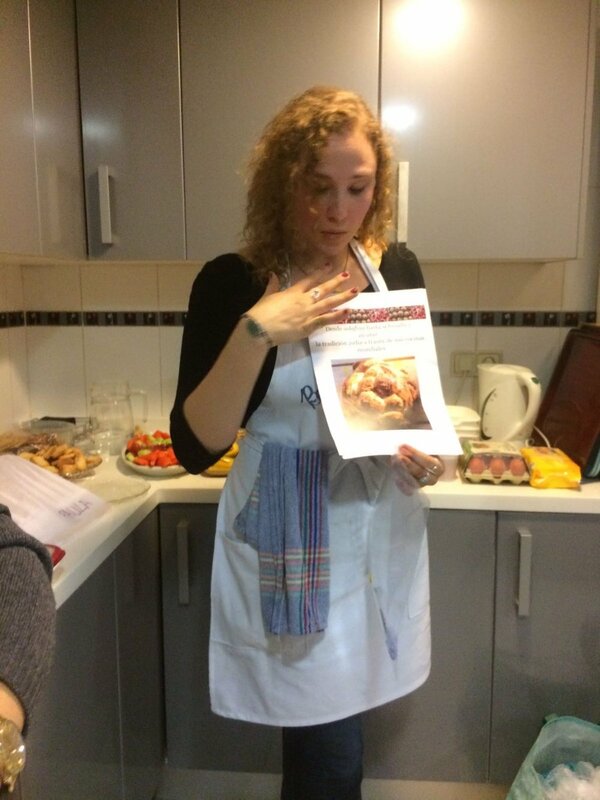 Teaching the course for the Madrid Reform Community in my very own Boka Dulse apron. 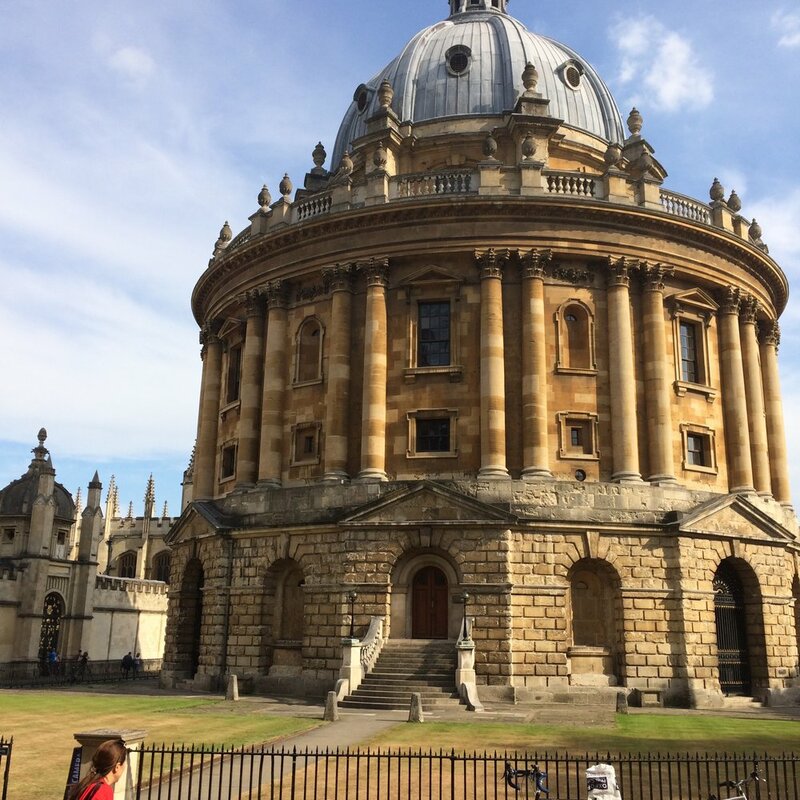 Getting ready for my presentation at the 2017 Oxford Symposium on Food & Cookery. I taught a class for The Gefilteria, an organization dedicated to "reimagining old world Jewish foods," on Sephardic culinary history. The class took place as a part of Brandeis University's GENESIS precollege program, and I had an amazing time teaching a group of engaged and engaging high school students about how Sephardic food came to be Sephardic food. A fun action shot from my cooking class on Shavuot culinary traditions. I was featured on RadioSefarad's English Corner and Recetas con Historia programs, invited to talk about the history of Sephardic Jewish food in Spain. The links to those recordings will be out sometime in September - will keep you all posted! And until then, you'll have to wait to see what I talked about... (hehe). I traveled to many of Spain's fabulous and vibrant cities, falling even more deeply in love with this country than ever before. For more information on where I went in each of those places, you can go to this page of the blog. For now, though, I'll leave you some of my favorite shots of the places I went. A shot of the famous Metropolis building on Calle Alcala. The Church of Santa Maria de Pilar in Zaragoza. A beautiful sunlit view from the Torres de Quart in Valencia. A dish of Adafina, a Sephardic Jewish specialty, prepared and served at my undergraduate honors thesis defense. Bienvenidos a Boka Dulse! | Welcome to Boka Dulse! This is a blog that’s all about the exploration and celebration of food history and culture. In Ladino (and in Spanish, though it’s spelled slightly differently – as boca dulce) boka dulse literally means “sweet mouth.” This phrase comes from a well-known saying in Ladino, the language of the (mostly Ottoman) Sephardic Jews (read about who they are here) that goes boka dulse avre puertas de fierro, which in English translates to “sweet words open iron gates.” Traditionally, Sephardic mothers and grandmothers (who were most often the main keepers of Sephardic culture) would say this refrain, or refrán, to encourage and commend good behavior (as well as condemn bad behavior too). According to the Diccionario Akal del Refranero Sefardí, a dictionary dedicated to the preservation and explanation of Sephardic proverbs and sayings, “one says” the refrain “to suggest that more is often achieved with kind words than with forceful ones [se dice para significar que muchas veces se conigue más con buenas palabras que pretendiendo imponerse por las bravas]” (pg. 51, my translation). My interpretation: be kind and you’ll go farther. Borekas, stuffed pastry turnovers, finished with sesame seeds and packed to go. The name Boka Dulse also implies the Sephardic roots of this blog. Though I am of Ashkenazi (Eastern-European) Jewish heritage, the majority of my academic research at Tufts University focused on the culinary heritage and cultural identity of the Sephardic Jews. The Sephardic Jewish community was expelled from Spain in 1492 and dispersed into a far-reaching diaspora; in many ways, the dishes of the Sephardim (as they are also known) in the places they settled reveal a great deal about their experience in that location. Through those dishes, you can see how the Sephardic community simultaneously shaped and was influenced by their new surroundings – as well as whether or not its relationship with the Sephardim’s new host community was a happy one. On this blog, you'll find many Sephardic recipes and histories (as I'm most knowledgeable about Sephardic culture), but you'll also find dishes and stories from various cultures and communities across the globe. A shared plate of homemade couscous in the Moroccan Rif Mountains. My research clued me in to the ways that food does so much more than nourish our bodies - it helps cultivate our identity and self-perception, especially in relation to the diverse communities to which we belong and with which we interact. Our food tells the story of who we are and how we exist in the world, so I wanted to create an online space to tell (and of course taste!) those stories. That's another level of the name’s significance: I’m not simply providing you with the histories of the people and the communities that make these dishes, but I also want to give you the opportunity to make and taste them in your own kitchen, with your own boka. So, in every post you’ll find a story and a recipe, one that I’ve tested and tailored to be more compatible with the modern kitchen. By preparing and eating these dishes, you'll be able to interact and enjoy these traditions on a tangible level - in hearing the exciting sizzle of a hot pan, in feeling the comforting, aromatic steam billowing from a stewpot, as well as in seeing the delighted looks of dinner guests when a just-finished dish is placed on the table. Homemade cinnamon-sugar challah ready in time for Shabbat, the Jewish day of rest. I created this blog to be a celebration: of family, of community, of people coming together to share a plate of really delicious food. I want it to be a hopeful space, one that inspires you with the personal stories and narratives that every dish and ingredient represents as much as the flavors and ingredients they contain. My mother's beautiful Thanksgiving table. And that’s where the dulse—the sweetness—comes in. Because I believe that we share so much more than nutrients when we make and eat food together; rather, we give of ourselves. Every time we partake in communal meals, we bring together all the different stories and histories – in short, the identities – that our food represents. In that way, a meal is more than an excuse to eat: it’s an edible, enjoyable microcosm of peaceful coexistence. That’s why this blog is called Boka Dulse: it is my way of showing that through sharing sweet words and even sweeter (read: generally delicious – no discrimination against the savory here) food, we can more easily transcend whatever iron gates – literal and figurative – that work to separate us. I hope that they are words and tastes that find their way into your kitchen too, dear reader. And now – vini gizaremos: let’s cook! The spread of dishes that represented the chapters of my senior thesis: borekas, almodrote, huevos haminados, keftes de prasa, adafina, and dulse de mansana.